Who Are The Orange Hippos? We are! Yes, that is us. We are the Orange Hippos. If you're thinking that this is not the most flattering name, well, maybe it isn't. Some might say that it is quite appropriate - although none of us are orange. Personally, I'm incredibly proud to be an Orange Hippo. I honestly cannot think of anything better. For you see, Emmett has a lot of say in our combined households and when he chose the team name, that became our team. He had three names to choose from and I cannot even remember what the other two names were. Suffice it to say that they were not memorable. Plus, Emmett didn't like them. You may have gathered by now, that if Emmett likes and approves something, then I adore it. I'm his grandpa so I can do that! 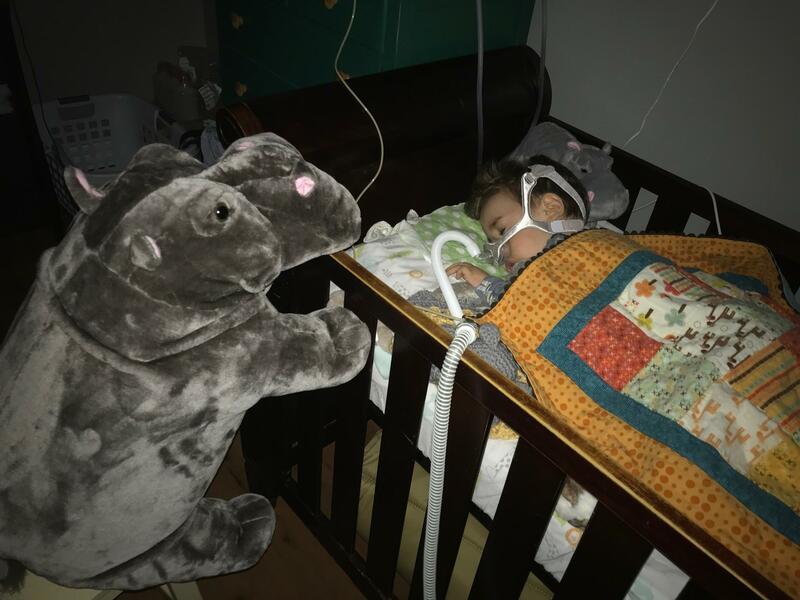 If you've been reading the blog then you know that Emmett loves Hippos. He went through a number of animals early on, but Hippos have been a favourite for nigh unto two years. (I've always wanted to say 'nigh unto' so I deleted nearly and typed in 'nigh unto'. And now look at how many times I've used 'nigh unto'. Things like this make me happy.) Orange is his favourite colour. It has been for n ... nearly two years. Carrots are his favourite food - because they're orange, of course. They are also a lot easier to hold that peas or watermelon. 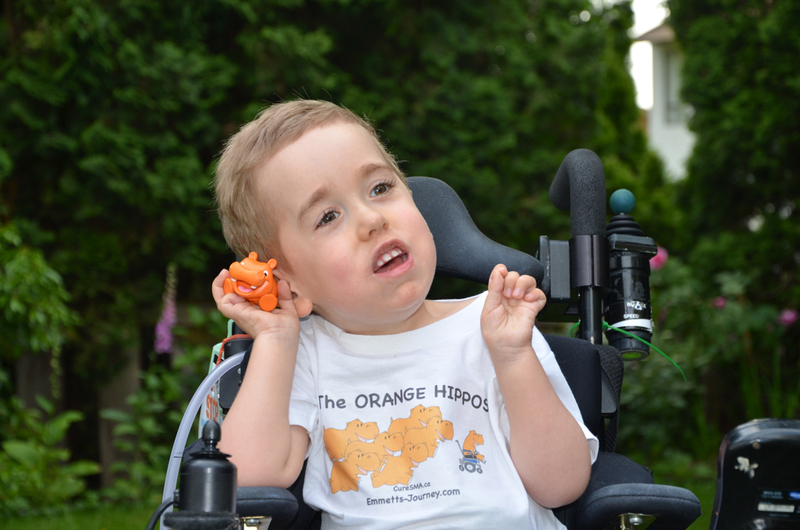 Plus one of Emmett's favourite squeeze toys is a little orange hippo. 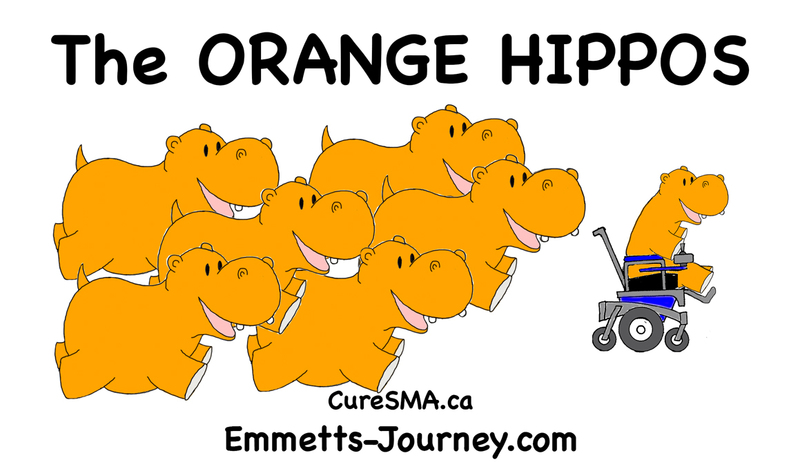 So Emmett instantly chose the Orange Hippos as our team name. You may be wondering what team this is. Well, of course, this is Emmett's Team. We are going to be walking/rolling/running in Florence and Charlie's 10K to end SMA. And we are looking for people to sponsor us - tax receipts are available. This run takes place on August 19, 2018 in Stanley Park, Vancouver. If you want to walk/roll/run with us, you're more than welcome to. We would love to have you join us! Details are in links at the bottom of this blog entry. 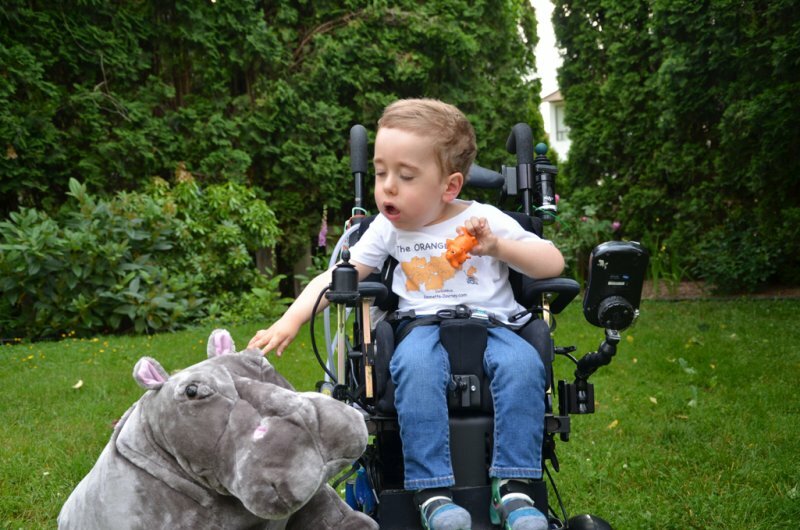 What is amazingly special for all of us Orange Hippo's is that it was on August 19, 2015 that Emmett was diagnosed with Spinal Muscular Atrophy, Type 1. Three years ago. Oh my goodness, that is a day that we will not forget. Ever. All of our lives changed in an instant - and we were sort of preparing ourselves for some difficult news. 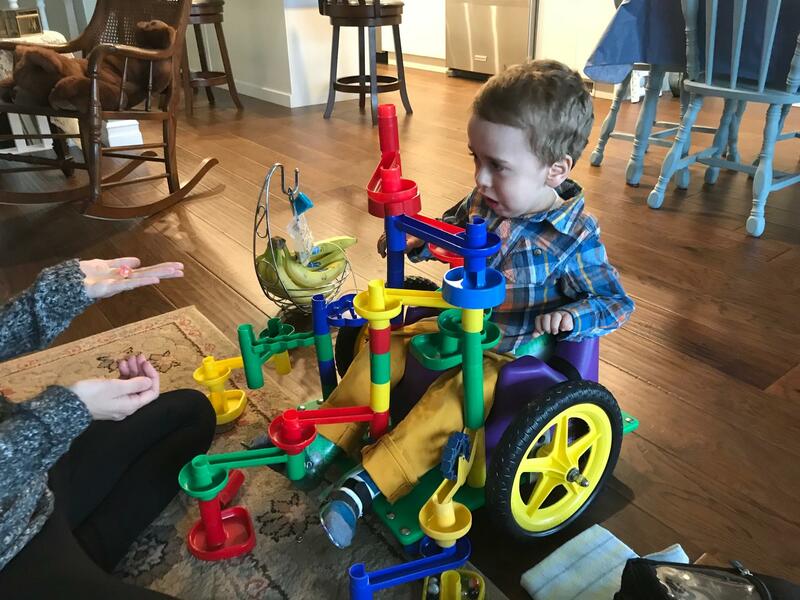 There is absolutely nothing that can prepare you for a five month old getting a diagnosis of Spinal Muscular Atrophy, Type 1. A disease that three years ago had no medical options for treatment. A genetic disease that took away the life of most little ones afflicted with it BEFORE they reached two years of age. The walk itself is named after Florence and Charlie, who are two little girls. Florence lost her battle with SMA. Charlie also has SMA Type 1 and is now on Spinraza and is fighting this genetic disease with everything that she has. The girls' parents started this run a few years ago and they are working hard to raise funds to find a cure for SMA. All funds raised go to CureSMA Canada. You see, there are children and young adults across our country that are fighting this disease. And now they're also fighting to get access to Spinraza, the only treatment that is available for SMA. 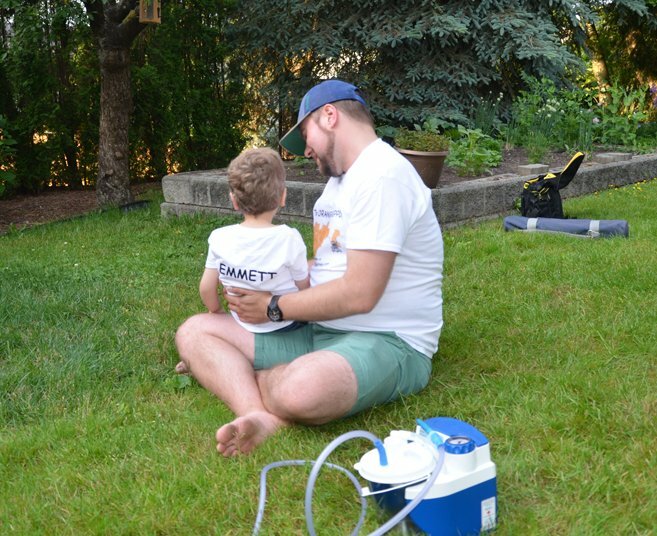 This drug wasn't available in 2015 when Emmett was diagnosed. There was no available treatment. 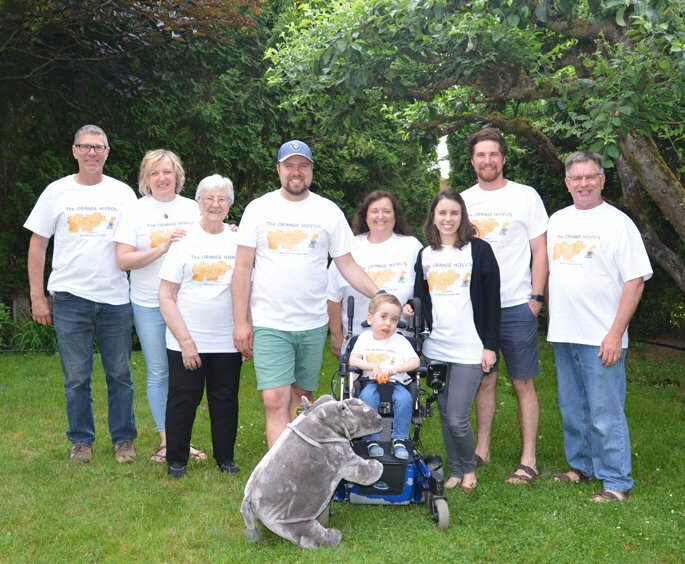 Emmett was lucky in that he was one of 124 kids from around the globe that was invited to participate in a blind study for an experimental drug. The drug that was eventually named Spinraza. This, by the way, is Po. Po is the latest Hippo to join Emmett's menagerie of stuffed, rubber, and plastic hippos. What is unique about Po is his size! We have decided that Po is a grandpa hippo! Po has guarded Emmett at night. The issue with this is that Po has absolutely startled (scared the pants off, to be truthful) both Alisha and Josh when they checked up on Emmett in the evening. A dark room. A large creature hovering over Emmett. You get the picture. Emmett loves sleeping with a few choice members of his menagerie. He invited Po into his bed once and quickly kicked him out. Po is just too big! To make a pledge for the Orange Hippos or, even better, to sign up for the run, please click on this link to the Running Room. https://www.events.runningroom.com/site/?raceId=15056, this will take you right to Florence and Charlie's 10K event. Then go to the Fundraising link. There click on "Search by Name" and type in Alisha Willms. She is Emmett's mom and our Orange Hippos' Team Captain. Then you can pledge your amount. Thank you for your words of encouragement, your moral support, your prayers, and for considering sponsoring us for this worthy cause.